Have you ever bought something on a whim? A couple of months ago, I saw someone talking about Food Huggers on Facebook and on a whim I went to kickstarter and supported them. Then I forgot about it. Just last week, the new set arrived. I am quite excited to use them and will report back on how well it works. 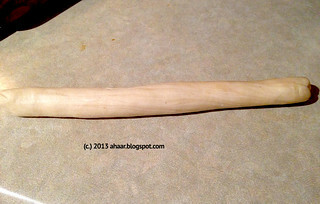 And they make excellent toys to distract a 1-yr-old while I chop and prep for cooking as well. 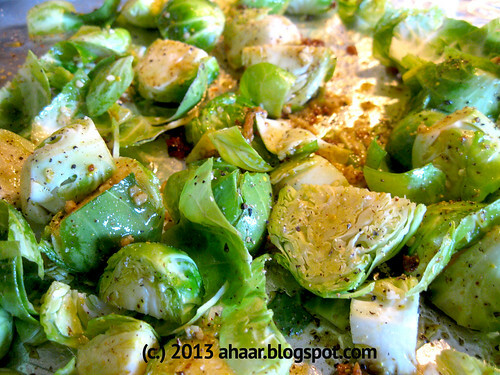 I love brussel sprouts and usually roast them for a quick side. Every time I roast them, I use a different spice mix. I think I may have found a good combination in the mustard paste, garlic and lemon juice combination I used this time. If you are still thinking about a side for Thanksgiving, give this a try. Cut the brussel sprouts. 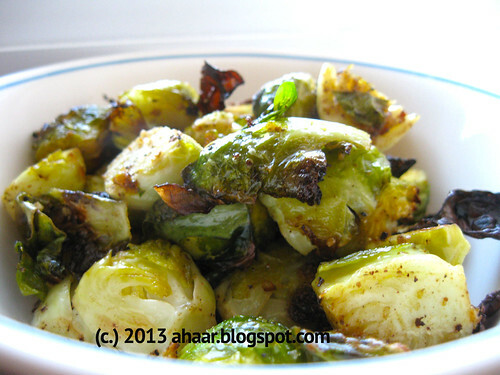 In a bowl, mix the mustard paste, lemon juice, garlic with salt and pepper and mix it generously with the brussel sprouts. Set it aside for 30 minutes. 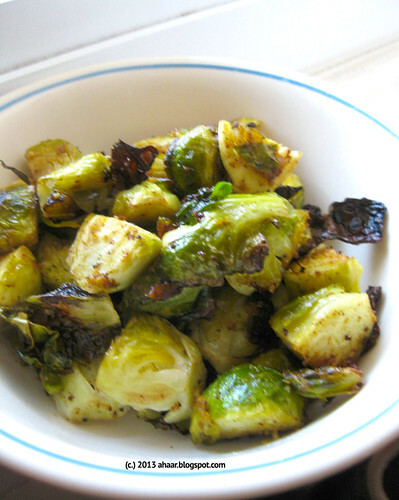 Roast the brussel sprouts for 18-20 min till they are done. I have been missing from the blog for a while. First I was busy at work and then I was in India for a week traveling for work and now am catching up. How have you been? While there, I got to eat some delicious food. Most of the working lunches served buffet style at different institutions. I am curious about one fact. I saw different kind of sandwiches, pasta, cutlets and boiled vegetables on the menu. Is this the new norm or was it because there was an American delegation visiting? Please leave me comments and let me know. 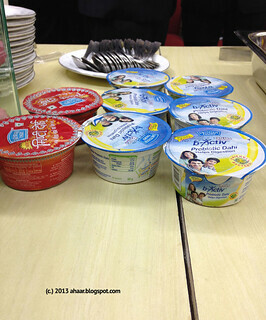 I tried the Mother Dairy Mishti Doi and have to say it was pretty darn good! Before I left, we celebrated Tiny M's first birthday. I made two simple cakes - one was a banana cake and the other one was a orange cake. 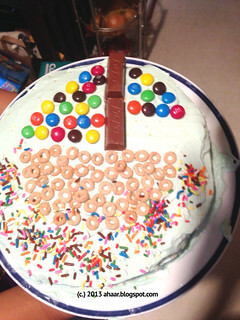 The frosting was whipped cream with a sail boat theme. We also hosted a Diwali party for family. The menu was a mix of Tanjore Marathi and regular food with 3-4 different kinds of sweets. Before we sat down for dinner, we even braved the cold to set off some sparklers and fireworks. 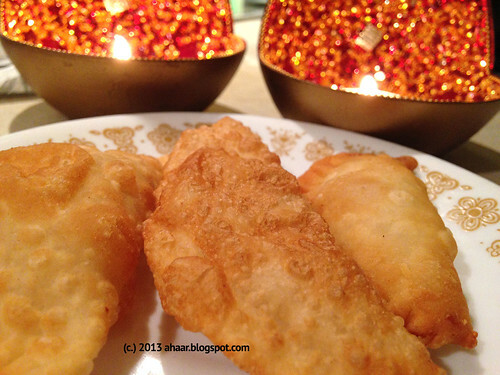 Everyone is now planning for Thanksgiving menu, but I have to tell you about this somasi I made for Diwali. 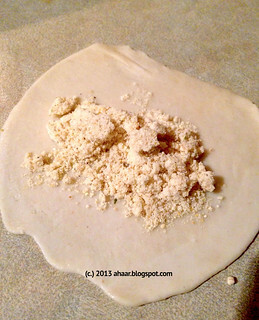 The name gudu gudu comes from the sound the filling makes inside. My MIL had been telling me about this sweet and I decided to try it even if it meant deep frying late at night. We made it in a few batches after the kids went to sleep. They turned out well and we had a special treat for Diwali dinner! 1. 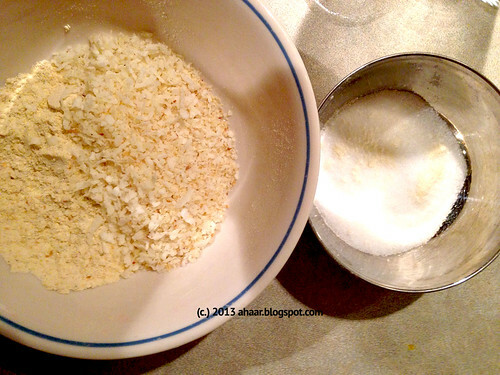 Grind the gram flour and toast the coconut and poppy seeds. 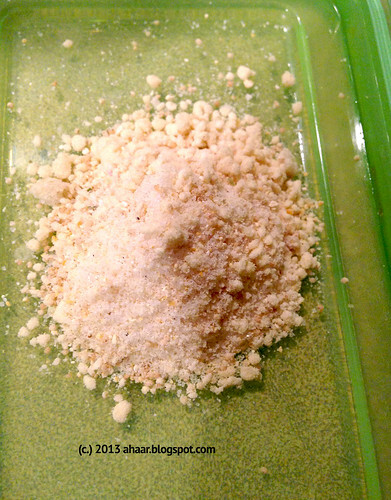 Grind the sugar with the cardamom powder. 2. Mix it all together to make the filling. Now set it aside. 3. 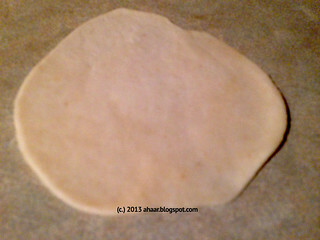 Mix all-purpose flour, rava, salt and oil to make a soft dough. Set it aside for 30-45 min. 4. Roll out the dough long. 5. Cut 15-16 equal pieces. 6. Roll it out thin. 7. 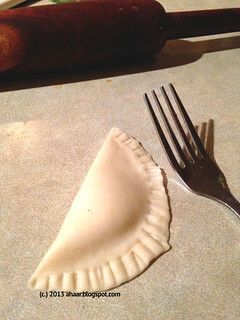 Then put a t-spoon of the filling. 8. 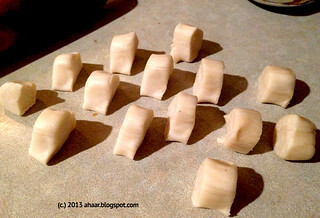 Close it tight and then deep-fry a minute or two on each side till they are golden brown.